Mayor David Briley comes to school to meet students in the Opportunity Now Interns program at Belmont University in Nashville, Tennessee, June 19, 2018. 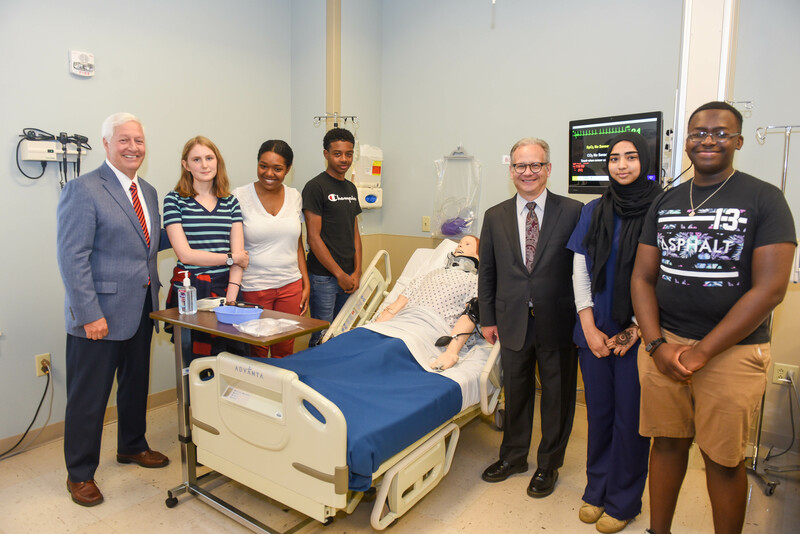 Mayor David Briley spent Tuesday morning touring Belmont’s McWhorter & Inman Health Science Centers as he visited the Opportunity Now (ON) students who are participating in internships on Belmont’s campus. The 15 students, who represent only a portion of the ON interns across campus, have been assigned to work with Psychology & Health Sciences at Belmont. Interns, 10 in total, working within Psychological Sciences at Belmont have spent their time on campus learning about the research process in psychology and improving critical thinking skills, under the direction of Department Chair and Associate Professor of Psychology Dr. Linda Jones. Upon first arriving to campus, the group began discussing exercise before moving on to nutrition. Students have completed a health assessment, wear fitness trackers, track their meals and continue to monitor their personal data throughout the summer. The students have also worked within a fish research lab, seeking to understand the concepts of learning and conditioning which directly correspond to human learning strategies. Those who have been assigned to the College of Health Sciences and Nursing, working under the director of Assistant to the Dean Sandy Dowling, have participated in many activities during their time on campus including completing administrative tasks, gaining exposure to all five of the College’s disciplines (nursing, social work, occupational & physical therapy and public health), and more. While working along OT, students had the opportunity to organize, repair, clean and even create therapeutic toys through Belmont’s Go Baby Go, a program that provides modified toys for children with special needs. Before the end of the summer, the interns will participate in a live GBG experience, where they’ll see the toys they’ve been working with in action. Interns have also spent time in the nursing simulation labs this summer where they have cleaned, organized and repaired equipment and even participated in simulation events. The group was actively involved in the College’s Health Academy Camp, an opportunity for local middle school students to gain exposure to the health sciences. For one intern, the opportunity to participate in an internship at Belmont this summer become very personal as she made the decision to attend the University in the fall. After visiting campus last year and “falling in love with the school,” incoming freshman Iman Haurami joined the Opportunity Now program and has been working with Jones for the last few weeks. Since beginning her time as an intern this summer, Haurami and her fellow students have spent time deep in discussion surrounding human intelligence and personality, while learning how to operate machinery and conducting experiments on biofeedback and reaction time. Currently, the students are training beta fish to go through hoops and eat from a wand, information that will allow the group to understand behavioral habits and processes.